We made homemade tortillas and smoked up the kitchen in the process (the pan I think was too hot?) requiring that we open all the windows though there was not a breath of air in this Texas Hill Country post lots of rain evening. To complete the eventful dinner time , my husband, who has dementia, built his own taco but he did it completely upside down. He put all of the ingredients in layers on his plate starting with the sour cream, the cheese, and the chunks of chicken and then topped it with a tortilla. I just watched (more like an artist, less like a caregiver) to see what would happen next as he turned his plate upside down and it all fell off to the table, disgustingly. I could’ve helped him but he seemed determined. He scraped it all off with the tortilla and ate it. I figured it was just a matter of a quick wipe up when he was done. I’ve seen worse being a mom of three. But the chicken tacos with the fresh tortillas were just delicious. And then we ate ice cream. And who could argue with that? 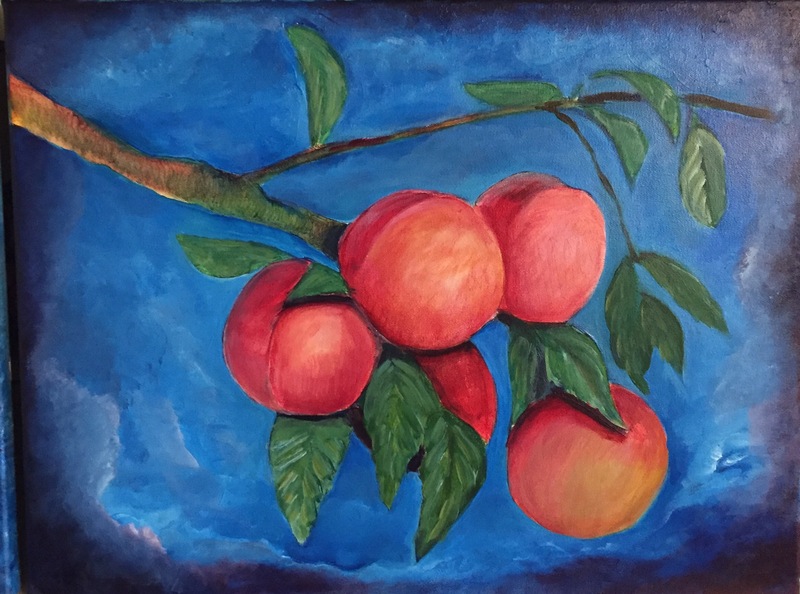 I painted my first peaches ever by looking at some pics online. 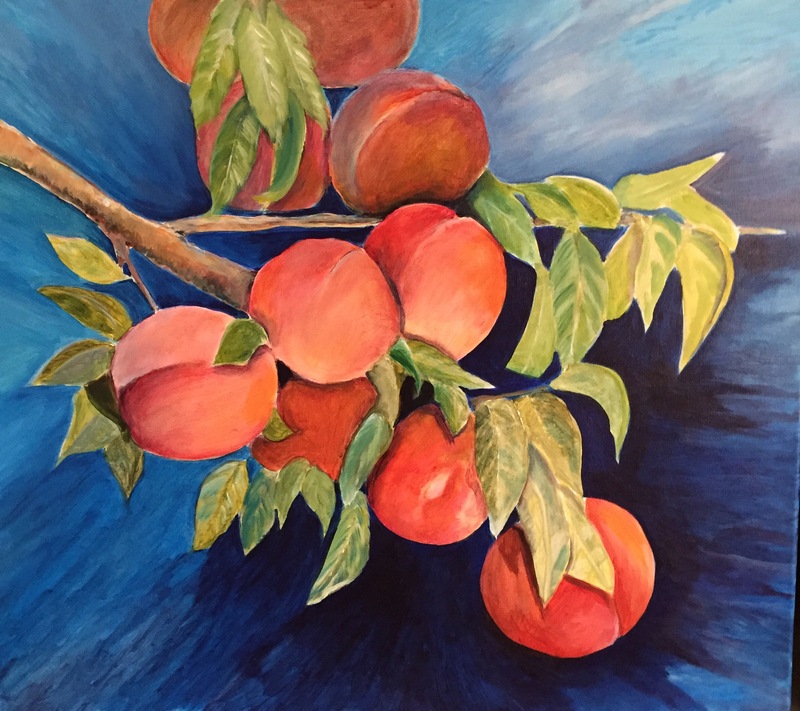 But when peaches come out this year I hope to be able to go pick some and get some pictures to paint. We have had no frost this year and lots of rain and I am sure the freestone peaches that grow in the Texas hill country are going to produce a banner crop. I love peaches. Before we moved here we would try to come in August or the beginning of September to enjoy the best of the peach crop. The peaches they begin advertising earlier than that are cling peaches. The difference is… The pit clings and the flesh of the peach is not as juicy and delectable. The freestone peach on the other hand is juicy and the peach pit (stone) basically falls out. My family buys bushels to slice and freeze to make peach cobblers all year. Last year I tried a new recipe and made a peach cake with a cinnamon swirl Krusteaz baking mix. I mix in extra flour because those delicious peaches are so juicy.